The picture above is of Walt Whitman's tomb. Death is a serious business. 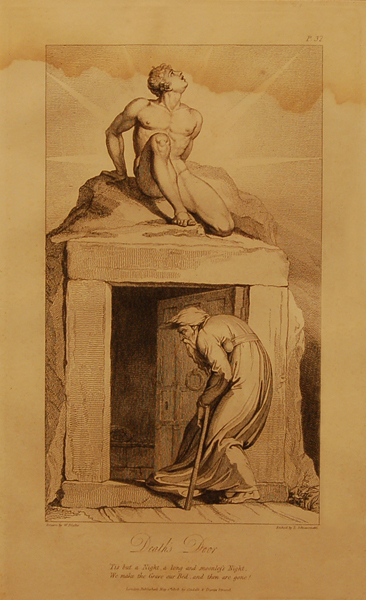 The second line of Blake's inscription reads, "We make the Grave our bed, and then are gone!" We mourn when an elderly person dies a natural death. But when a young person dies an unnatural, unnecessary death, we are even more horrified, and rightly so. When such a death is the result of foul play, we call it murder. When someone executes large numbers of women and children, we call the perpetrator every name in the book: vile, evil, serial killer, mass murderer, etc. If someone attempts to wipe a people from the face of the earth, we speak of ethnic cleansing and genocide, perhaps the most disturbing terms in the English language, because they speak of an unspeakable depravity we know some men are capable of: men like Hitler, Himmler, Eichmann, Goering, and Mengele. Is there a Death's Door in Gaza, with the people on the outside being free, and the people on the inside ― including multitudes of innocent women and children ― facing unjust deaths and the possibility of extinction? Please allow me to tell my story, then you can be the judge. A few months ago, I agreed to help a teacher financially by paying her for articles about her experiences in Gaza. She was trying to raise the funds required to travel to Gaza and take a teaching position there. I was interested in hearing what the children of Gaza had to say, in their own words. So we struck a deal: I would help her financially, if she would provide me with the accounts of the children of Gaza, in their own words. We agreed that the children's names should not be revealed, as the government of Israel has been known to treat Palestinian dissenters and their families brutally: for instance, demolishing their houses and leaving them homeless and destitute. I didn't want to be responsible for the children and their families suffering repercussions for anything I published, so it seemed wise to keep the children's identities confidential. Therefore, I will also keep their teacher's name confidential, as revealing it might lead back to the children. I will call the teacher "Esther," because Esther was a courageous woman who saved her people from possible genocide, and I hope "my" Esther will do the same for the children of Gaza. Once Esther made it to Gaza and started teaching there, she kept her word and sent me a number of pieces written by her students, along with her own thoughts. We were off to a good start. You can read what she sent me by clicking this link: The Children of Gaza Speak: Who Will Listen? Finally, after what seemed like ages, I heard from Esther. She had contracted encephalitis and had nearly died. The hospitals and doctors of Gaza were not equipped to save her life, so she had been rushed to a hospital in Tel Aviv. The doctors there had been able to save her life, barely. She informed me that she was in good spirits, but faced many months of recuperation. She would be returning to Canada as soon as she was able to travel. I have also kept the name of Esther's husband name confidential, above, in order to protect the identities of her students. What Esther told me confirmed what I have heard from a number of sources, including Jewish humanitarian organizations and other people I know who have traveled to Gaza and the West Bank: the lives of completely innocent Palestinian women and children are constantly endangered by the so-called "security walls" Israel has used to keep Palestinians "out of sight, out of mind." Pregnant women and children in need of medical attention are dying in the shadows of those killing, dividing, conquering walls. How would we feel, if someone in our family needed immediate medical attention, and they were denied access to hospitals and doctors? It's hard for Americans to imagine the horror of a family member needing medical attention urgently, and having someone armed with a machinegun at a military checkpoint in the shadow of a wall twice as high as the Berlin Wall say, "Well, it's just too bad, but she wasn't born Jewish, so she'll just have to die." Esther has a husband and five children. If she had been the best, most loving Palestinian mother on the planet, today her husband and children would almost undoubtedly be mourning her death. She is only alive because she was "lucky" enough not to be a Palestinian. How does that make me feel? It makes me feel sick to my stomach. My father is American and I'm an American citizen. My mother is English and I lived in England for five years as a young boy. The governments of the United States and Great Britain have colluded with the government of Israel to deny Palestinians any chance of attaining freedom or equal rights. So I feel betrayed. But the betrayal I feel can hardly compare to the betrayal Palestinians who have lost family members must feel. So I understand the deep resentment and anger that led to 9-11 and two terrible wars. If someone had killed my mother or sisters or wife or children by denying them basic human rights, how would I respond, myself? What do American men do, when our women and children are endangered? What did American men do to Germany, to Japan, to Italy, to Libya, to Afghanistan, to Iraq? I think it's past time for Americans to be honest, and admit that we would never stand for American women and children being treated the way Israel treats Palestinian women and children. If Israel treated American women and children the way Palestinian women and children are being treated today, the American military would rain down missiles on Tel Aviv, until Israel's government came to its senses. So why should Americans be hypocrites and pretend we wouldn't do exactly the same thing as Hamas, under the same circumstances? Are American men the only men entitled to defend their women and children? If we want peace, we need to persuade Israel that racism and racial injustice are wrong, and that it's time to stop treating Palestinians the way Jews were treated by the Nazis, and the way black Americans were treated during the days of Jim Crow laws and kangaroo courts in the Deep South. As long as Israel continues its despicable system of Jim Crow laws and kangaroo courts, according the the American Declaration of Independence, the Palestinians have the right and duty to resist forcefully. According to the American Declaration of Independence, the government of Israel is not a legitimate government if it denies Palestinians equal rights, justice and representative government. As long as the government of Israel continues to practice systematic racism, apartheid, and government-sanctioned ethnic cleansing, its government and "laws" are illegal. It is not a crime to break an illegal law, so Palestinians who resist the government of Israel forcefully are only following in the footsteps of Thomas Jefferson and George Washington, who claimed the right to kill Englishmen as long as Englishmen denied them their rights. Does this make violence and war inevitable? Not at all. If the British monarchy had granted Americans equal rights, the Revolutionary War could have been avoided. If the confederate states had granted blacks equal rights, the Civil War could have been avoided. If Germans had granted Jews, Gypsies and Slavs equal rights, the Holocaust could have been avoided. It is incumbent on the government of Israel to grant Palestinians equal rights, or to set them free, if Israel really wants peace.